Many people dread the coming of spring because it also means the start of allergy season. Nothing is worse than spending your days in a mental fog, sniffling and sneezing, with no relief. Did you know that dogs can suffer from allergies as well? They may not manifest in the same way and they may be caused by different things, but allergies in dogs can be just as serious as they can be in humans. At the core of the issue, an allergy is an immune response to a particular substance – when your body starts to recognize a particular substance as foreign (or dangerous), your immune system kicks in to fight it. Allergies in dogs work the same way, though the reaction may not look the same. For the most part, animals are better at combating environmental allergens but, if your dog does have a reaction, it is more likely to be a serious one. For dogs, allergens can be inhaled, ingested, or they can simply come into contact with his skin. As your dog’s body works to get rid of the allergen, you may notice a variety of problems related to your dog’s skin, his digestive tract, or his respiratory system. In addition to these symptoms, dogs that suffer from allergies are also at risk for secondary bacterial or yeast-related skin infections. These secondary infections may cause skin-related symptoms such as scabbing and hair loss to worsen. Which Breeds Are Affected and By What? As is true for humans, there are many things a dog can be allergic to. There are environmental allergens like pollen (from trees, grass, and weeds), mold spores, dust mites, and feathers as well as things like dander and cigarette smoke. Dogs can be allergic to perfumes and various cleaning products as well as certain fabrics or other materials, like plastic or rubber. Some dogs develop allergies to certain flea and tick preventives as well as certain shampoos and other pet products. About 10% of allergy cases in dogs are caused by foods. There a number of foods that dogs can be allergic to but the most common are beef, chicken, pork, eggs, dairy, corn, wheat, and soy. In reality, however, dogs can be allergic to any food ingredient. Dogs don’t react to things in the same way that people do. For example, if you were allergic to a certain kind of food, eating that food might cause your stomach to become upset. In a dog, however, food allergies are more commonly associated with skin-related problems such as itching and inflammation. Depending how severe the allergy is and how long your dog continues to be exposed to the allergen, there may be digestive symptoms as well but they may not develop right away. This is why it can be difficult to diagnose allergies in dogs – particularly food allergies. Part of the diagnostic process involves eliminating other possibilities. If you suspect that your dog is suffering from some kind of allergy, your first step is to take him to the veterinarian. Your veterinarian will run a battery of tests and perform a physical exam to rule out potential medical causes for your dog’s symptoms. If these tests don’t reveal anything and allergies seem to be the culprit, your next move is to switch your dog to a limited ingredient diet. A limited ingredient diet, or LID for short, is simply a dog food product that is made with a simple list of ingredients and, ideally, a novel source of protein and carbohydrate. What you may not know is that dogs can develop allergies to foods that they are exposed to over a long period of time. Removing that food from your dog’s diet is the best way to combat an allergy. But how do you determine which ingredient is causing the problem? That’s where an LID comes in. 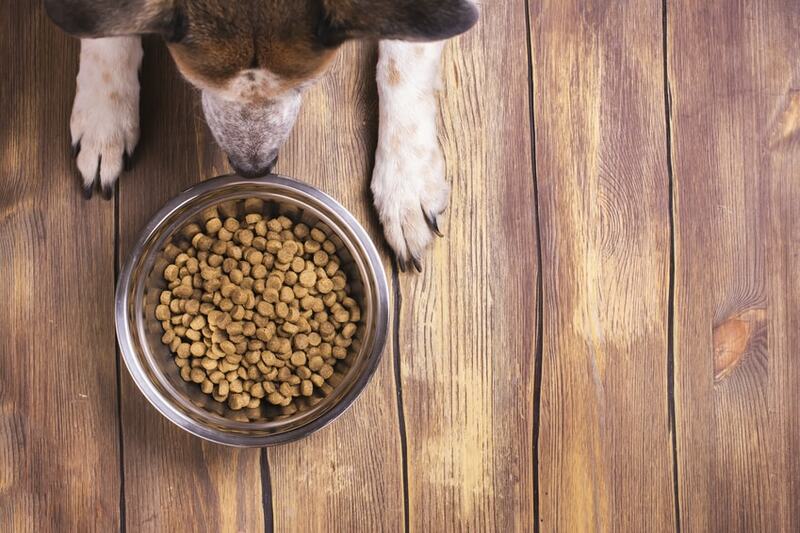 Many pet food brands offer limited ingredient diets so, while it may take some searching, you can find one that doesn’t include any of the main ingredients from your dog’s last diet that likely caused the allergy to develop. In addition to eliminating potential allergens, feeding your dog a product made with a limited number of ingredients will further reduce his risk for developing new allergies. The key is to find a product that contains a novel source of protein and carbohydrate. The word “novel” simply means an ingredient that your dog has never had before. For protein, this could be something like duck, rabbit, lamb, or venison and, for carbohydrates, it could be something like potato, oatmeal, sweet potato, or tapioca. Once you choose an LID, feed it to your dog for a period of at least 12 weeks until all traces of the allergy disappear. If, after your dog has recovered from his allergies, you want to identify the allergen causing the problem, introduce potential allergens one at a time and gauge your dog’s response. A sudden case of diarrhea or the development of skin problems may be signs that you have found the ingredient that is to blame for your dog’s allergies. Once you’ve identified your dog’s allergens, you have two choices. First, you can select a new dog food product that doesn’t contain any of your dog’s allergens. Second, you can just continue to feed your dog the Limited Ingredient Diet you have been using for the past twelve weeks. Just make sure that you avoid your dog’s allergens in everything you feed him – this includes treats as well as any table scraps or “people” foods you treat him with. Allergies can be a serious thing for dogs, just as they can be for people. Environmental allergies can cause severe skin problems as well as digestive and respiratory issues that could affect your dog’s quality of life. Food allergies are just as bad, or perhaps even worse because they could compromise your dog’s ability to digest and absorb nutrition from the food he eats. If you suspect that your dog might be suffering from food allergies, consider switching to one of the allergy-friendly brands reviewed above to give your dog some much-needed relief.